9.5 to 18 VDC, .020 amps nominal. 0.35 amps maximum when active. Built-in 105 dB audible alarm, blinking LED. 8 amp light flashing circuit to flash spreaders/running lights, etc. Five inputs on screw terminals. Three activate the alarm when grounded or go low (below 5 VDC). Two activate the alarm if they go high (+2 to +33 VDC). One of the latter purposely bypasses the RESET button and cannot be turned off at the LA20 (must be turned off at the alarm source). The LA-20 External Multi Alarm has five alarm input terminals and connects up to five instruments to provide an amazing loud 105 dB alarm volume that can be heard for 1/4 mile or more. A built-in light flashing circuit will flash spreader, running or anchor lights drawing up to 8 amps. All five inputs terminate on screw terminals making connections easy and require only a screwdriver. Four of the five alarms can be silenced by pressing the RESET button, one purposely bypasses the RESET button and must be turned off at the source (good for security alarms). Two different types of inputs are provided. Three inputs activate the alarm if any one of them are grounded or go below 5 VDC. 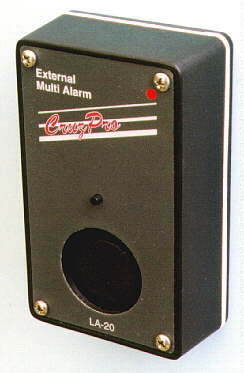 The other two inputs activate the alarm if one of them goes high (+2 to + 33 VDC). One of the latter bypasses the RESET button (cannot be turned OFF at the LA-20). If the LA-20 is silenced by pressing the RESET button, it automatically re-arms itself when all the inputs are in a clear state. Connect the alarm inputs using 22 gauge (or larger) wire. Signals connected to the terminals marked "L" in this figure will activate the alarm if they are grounded or go low (below 5 VDC). Signals connected to terminals marked "H" activate the alarm if they go high (+2 to +33 VDC). The signal connected to terminal "HB" activates the alarm if it goes high (+2 to +33 VDC), bypasses the RESET button and cannot be silenced at the LA-20 (must be turned off at the alarm source). The "O" terminal connects to your spreader, running or anchor lighting circuit and can flash lights up to 8 amps at 12 VDC.